Proud to announce I'm one of the Solar Guitars Artists! I've had my guitar since early August and it's one of the best guitars I've played, so happy with it! I also had the honor to demo almost all the available models and can say that each and every guitar I tried felt amazing. Tabs, detailed walk throughs and more! I've just launched my first practice companion. What's a practice companion you might ask? It's basically a video tutorial based on a specific lick that I post on my Instagram and youtube account. In the video I'll go through the lick in detail as well as give practice tips and tricks that you can use not only on the lick in question but on other similar lines you want to play. I also include full tabs in guitar pro and pdf format in the package. The price is PWYW (pay what you want) and even though the suggested price is 5 dollars or more I want this to be available even if you're short on cash at the moment. Get the Pentatonic Picking Practice Companion here! 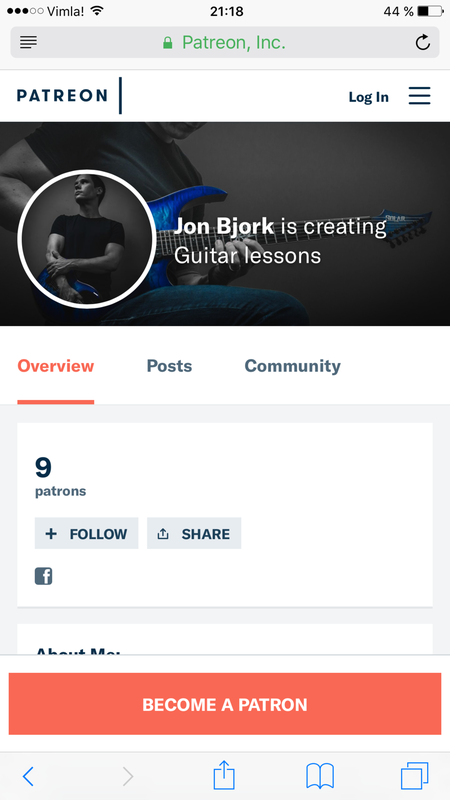 Visit my Patreon for tons of tabs, licks and lessons! Link below.